Those of you that know me a little will know that I love the word "awesome". I don't set goals for good, or even great. What I want to reach is awesome, and that's just want I'm aiming for in 2016; for it to be even more awesome than the years that came before it. You may also know that I love a good challenge. I'm very goals oriented, and the idea of a whole year ahead gives me that butterfly feeling in my stomach as I buzz with excitement about all the new possibilities and opportunities ahead. 1) Be a healthy worker. I'm a workaholic by nature and, as I love what I do, I often forget to have down time. I get so caught up in my ideas and projects that I then get forced into taking down time because my body says it's had enough. Seriously, you know how Facebook has that memories feature where they show you stuff you posted on that day in the past? Well, every year my posts from November to February show I'm always ill. I kid you not. It's gotten so bad that it's now considered a yearly tradition. I'm not limited to just the winter months either. My poorly functioning immune system crumbles on me at random points through out the year too. I think we can all agree that being ill is no fun so, my first goal for 2016 is to be healthy. I'll be scheduling in down time to make sure I don't get burn out, and making sure I do more exercise and eat better too. As my job as writer and illustrator means I spend a lot of time sitting down (something the experts tells us is bad for our health), I've decided to nurture my goal-junkie personality and set myself the challenge of doing at least 20 minutes exercise a day. The type of exercise will vary to stop me getting bored, so I could end up going for a jog, doing some yoga, or playing Dance 4 or Zumba on my Wii ( I have a feeling the latter will happen more regularly than the others do). I have more than enough ideas for projects I'd like to work on. My biggest problem is often picking which ideas to go with. Having such a big list of ideas can work against me too though. I sometimes end up wasting time picking an idea or getting side tracked by new ideas that finishing projects can be difficult. I'd like for 2016 to be my most productive year yet, and so have been working out a schedule for the projects I'd like to complete this year. This is a rough list of the books I hope to release during 2016. - Christmas Activity Books [I'm still working on a title for this series of books]. I made the decision to make creativity a career and that means I need to be making money doing it. I'm also quite ambitious and dream big. Despite having had some success over the years (thank you all for all your help and support with that btw ;)), I feel like I've only dabbled until now. 2016 is the year that stops. No more dabbling. It's time to turn myself into a prosperous business. Show me the money!!! haha, seriously though, it's time for me to move up a level, or three, and start making some real money. - Create more books. Both my own projects and collaborations with clients. - E-Courses. I've been working on these for a while now and this year will be launching several. - Blogging. I've been blogging for years but didn't look at it as a business in the past. That changed in 2015. It stopped being just a hobby and turned into a business. I'll be developing www.writersandauthors.info more this year and maximising its earning potential. Another important decision I've made to help me reach my income goals this year is to stop doing freebies. I don't mean I won't offer stuff for free. I love giving away treats. It's my way of saying thank you for all the love and support you show me. What I mean is that I'll stop letting people take advantage of me. When you work in the creative field people often feel like they can ask you for freebies. Whether it's drawing something or writing an article, you're giving away your value time (which could be spent earning money for doing the same thing). Time is money. Why is it that people think it's Ok to ask you to draw a picture for free, or write an article for free? Would they go into a clothes shop and take a top expecting to get it for free? or to go to a restaurant and eat for free? No they wouldn't. So why should your product be any different. And no, saying they want to "sample" your work first doesn't cut it either. Would they get the top from the clothes shop by saying they wanted to test it so they could consider buying a full outfit in the future? Would they get given a free plate of pasta if they said they'd consider coming back and ordering a 3 course meal on another day? No they wouldn't. Ok, rant over. The point is this; I'm going to stop under valuing myself and my work, and stop letting people take advantage of my good nature. Do you get people expecting to get your creative talents for free? This leads me on to the next point in my income plan; Paid guest blogging. I love writing articles for other peoples blogs and publications. It's a great marketing strategy too as it gives me the chance to reach new audiences. I will still do some guest blogging for free (like I said, it's good marketing), but I'll be concentrating on writing more articles for pay this year. What I want for 2016 is for it to be a healthy, productive, and lucrative year. What are your goals for 2016? 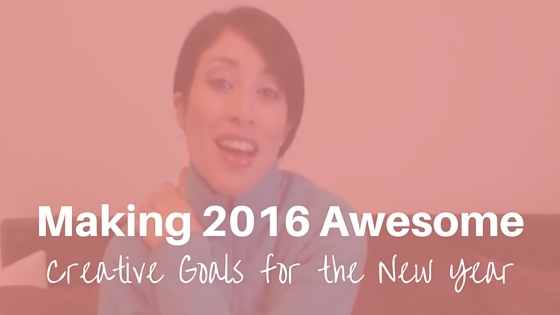 What changes will you be making to make sure 2016 is awesome?